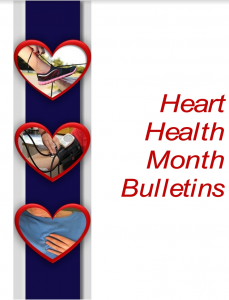 As February approaches, now’s your chance to celebrate Heart Health Month. Heart disease is the leading cause of death for both men and women in the US, but it can often be prevented when people make healthier choices and manage their condition. Our partners in the Cancer Control and Prevention Branch and WISEWOMAN Program developed the Go Red Toolkit for communities of faith. Go Red for Women is a campaign led by the American Heart Association. The purpose is to promote heart-healthy lifestyle choice to women (and their families). You and your faith community can participate in Heart Health Month by spreading the importance of preventing heart disease and encouraging your community to live heart-healthy lives. The toolkit includes bulletin inserts and fact sheets that you can share with your faith community. You will also find printing instructions, suggestions for distributing these resources, and social media post ideas. 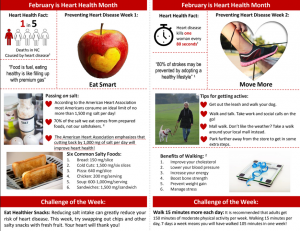 Everything you need to support Heart Health Month can be downloaded here.